Don't comment on what people are eating, please. Not a delicious sight for everyone. It's almost Christmas. The most wonderful time of the year for most. Especially if you're in Australia. It means delicious food, good company and some well-earned rest and relaxation. But Christmas can be a difficult time for some people, particularly people who have eating disorders. Over the past six years since I was diagnosed with anorexia, Christmas was a period of time that initiated a lot of anxiety and distress. It's a time when food is the focus of everyone's attention. There will be plates upon plates of food. Eating and grazing happening all day. I don't feel that paralysing anxiety now because I'm so far into my recovery. In fact, I'm looking forward to eating delicious food without any guilt or shame. But that wasn't always the case. For years, I dreaded the arrival of Christmas and all the stupid things people would say. For years, I dreaded Christmas dinner because I knew there would be copious amounts of foods packed with ingredients I couldn't control. And then there was the guilt after the meal. Analysing, stressing. Christmas just wasn't fun. I am fortunate that this year, after working hard for a year and a half on recovery, those feelings have almost entirely vanished. That's liberating. But that isn't the case for everyone. There will be hundreds of people across Australia sitting down to Christmas lunch and dreading every second of it. Feeling sick with anxiety and distress. Wishing that it would all just be over and wanting to escape it. 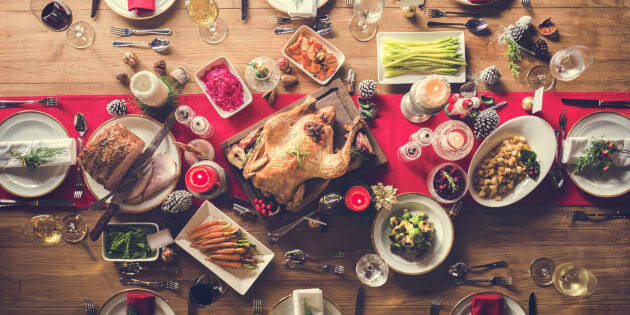 There will be hundreds of families across the country that have to navigate Christmas with family members or friends who have an eating disorder which is another challenge all together. Families who are stepping on egg shells, terrified that there's going to be a full-on mental health crisis at the dinner table. It isn't easy for many families. It wasn't easy for mine for a long time. So here are some tips for navigating the Christmas period. "This pudding is so unhealthy/fatty/bad"
"This can't be good for you." "I wonder how many kms I'd have to run to burn THIS off." "This has so many calories." "Calories don't count at Christmas." "I feel so fat. I'm not eating for days now." "I'm not eating ever again." "There goes the summer bod." "I'm starting my diet tomorrow." If you feel the conversation steering in this direction, move it on to something else. Like, "hey, did you see what happened at the cricket?" or "any plans for the new year?" "My god, that's a lot of pudding you're having." "You must be so hungry, you've eaten heaps!" "Do you want some more? Why not? It's Christmas, come on!" "You've hardly eaten anything! Have some of this." Just let people be. Of course, if you notice someone not eating anything at all then that needs to be addressed, but making a fuss at the dinner table is not the place for it. There is pretty much nothing worse, if you're struggling with eating problems, than someone pilling things onto your plate. Often, if you're suffering from an eating disorder, food will be at the forefront of your mind. You might be fine one moment but then completely panic the next when you're given the chance to over-analyse the food and your food choices. Try to keep the conversation flowing and away from topics such as food, indulgence and dieting. This can be a very difficult time of year for people with eating disorders. If you notice, on daytime television and in magazines, the emphasis after Christmas will be on shedding weight/detoxing and all of that irrelevant and toxic BS. Yes, at Christmas people like to eat and there's nothing wrong with that. Our bodies are good at processing food (that's part of its job). So please, enjoy the festive season but also be mindful that some people may be suffering and keep these tips in mind. This post first appeared on The Beauty Breakdown.